Truck: One of the Bigfoot trucks, usually #'s 8, 9, or 10. Racing Background: Snake Bite was created in 1991 by Bigfoot 4x4, Inc. It competed on the PENDA points series from 1991 to 1994. Now Snake Bite is used for non-points series competiton, as well as the "Safarifoot" rides. Truck Facts: 1997 Ford with GTS Fiberglass body and a custom nose. Flashing eyes, and snake fangs are highlited by a custom "scaled" paint scheme. The engine is a 572ci Ford Hemi. C6 Automatic transmission with Hurst shifter, TCI race converter, and all aluminum transfer case with quick change gears. 66x43x25" custom cut Firestone-Patented experimental 23 degree flotation tires. Sponsors: Ford Motor Company, RJS Saftey Equipment, Simpson Helmets, Deflecta Shield Corp., Miloden Inc., Flowmaster Mufflers, The Wax Shop, BASF Paints, and KC Highlights. Outstanding Achievements: Bigfoot and Snake Bite finished #1 and #2 in the PENDA points series in 1993 and 1994. 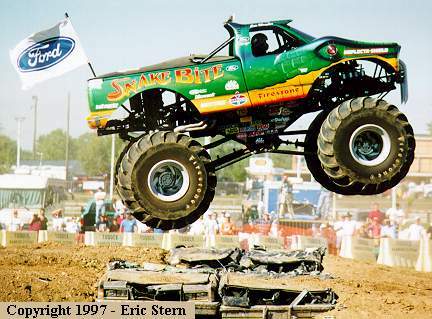 Snake Bite was the first Monster Truck to be retro-fitted with a fiberglass body other than that of the typical truck everyone was used to seeing.